The demonstrations, described by the Rev. Al. Sharpton as “pray-ins,” played out on a bright spring afternoon as boisterous displays of civil disobedience in which people signed up to be arrested, assuring organizers and lawyers that they were carrying proper identification to show to the police. Once positioned at the intersections, demonstrators dropped to their knees or sat and prayed briefly before hundreds of police officers escorted them to buses and police vehicles. These protests come at a critical time as local, state and federal elites – including black, Latino and other elites “of color” who constitutionally avoid dealing with police and other state violence- gear up to further ratchet up the already repressive legal and law enforcement structures they see as necessary to maintain order-and profits. So, saludos to Nicole Bell, Rev. Al Sharpton and the hundreds of activists here in NYC for responding to such injustices with civil disobedience. May more of us follow your example before the increased state violence and repression that looms alongside the economic meltdown. In the face of growing government violence, civil disobedience is not an option-it’s our duty. 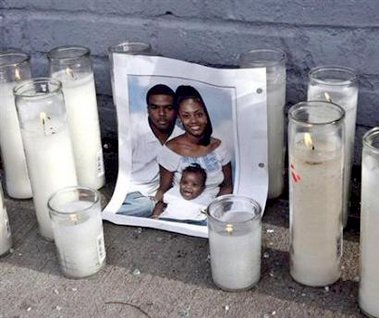 Today’s acquittal of the 3 police officers accused of killing Sean Bell in November of 2006 will complicate Barack Obama’s efforts to win the presidency in November 2008. His candidacy already mired in the racial machinations of his opponents, Hillary Clinton and John McCain, Obama will find himself having to maneuver between the need to speak out on the most egregious, high profile example of institutional racism and police brutality since the Rodney King Incident and the need to deflect Clinton and McCain’s racialized attacks aimed at fomenting white fear of blacks and other non-whites. While it has helped him win white votes, Obama’s approach to dealing with such racism by pointing to the black and white pictures of the civil rights past will not help him with his base in the black community and other communities. With the 16th anniversary of the Rodney King incident looming on the horizon this August 29th, none of us will be in any mood to hear calls to “hope” or “change” without similar calls to “justice”. Unfortunately for Obama’s presidential bid, calls to justice from African American and other groups often trigger fear among some (not all) white voters. The platechtonic political shifts brought on by the Republican party’s Southern Strategy were premised on precisely these racial and political calculations. With the help of political strategist Kevin Phillips, Richard Nixon pointed to black anger as a way to persuade to white southern voters that the Republican Party could best represent their interests. At a time when blatant racial codes have given way to the subtler racism of a post-Southern Strategy era, Obama finds his historic presidential bid bogged down by the new racial codes being engineered by the Clinton and McCain campaigns-and the mainstream media. Responses to the Sean Bell verdict will surely provide new codes, more political and racial fodder to those who won’t let the Jeremiah Wright scandal rest; those who seem to make racialized remarks involving Obama right before big primary votes; those who appeal to white fear among voters by linking Obama to fabricated images of black anger. Obama’s attempts to speak about real black anger during his Philadelphia speech appear to have been not well received if the media’s ongoing obsession with Jeremiah Wright is any indicator.Failure to use his rhetorical gifts to speak forcefully to and about real black and non-black anger about the Sean Bell verdict may re-animate doubts about commitment to that part of his base that is not white middle and working class. Beyond Obama, all of us need to raise our voices and point at the abyss of our country’s institutional racism as was painfully and transparently reflected in today’s verdict. We might want to start by pushing Obama, Clinton and McCain-and the mainstream media- to speak honestly and continually about what the 50 bullets in Sean Bell say about justice in the 50 states of our tattered and bloodied union. This article from the New York Times reminds me of another issue you won’t see or hear during the primaries and general election: police brutality and murder. Despite the continued abuse and even murder committed by police across the country, you won’t be hearing much about cases like that of Sean Bell on the campaign trail anytime soon. Bell was shot 50 times on his wedding day by NYPD cops who now want to bypass a jury and go straight to a judge, according to the NYT piece. I interviewed friends of Bell along with witnesses who described how the cops who killed him had been drinking the night of the incident. I took the pic above at the makeshift memorial friends, family and community members built just after the shooting on 25th of November, 2006. 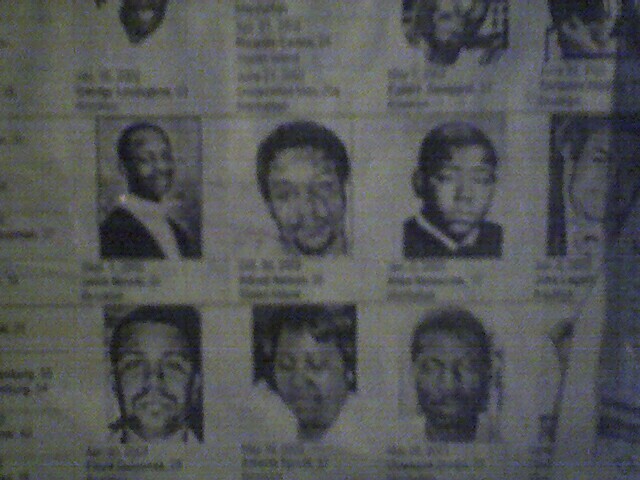 The picture is of a piece of a larger list of young, mostly black, mostly male victims, who, like Bell were shot by NYPD. Whatever the outcome of the trial, the case provides a good measure of the kinds of things the electoral and political system (and the privately-funded echo chamber, the MSM) either hides or ignores. I may be wrong, but my research does not seem to indicate that Sen. Clinton has made any comments about the high profile case involving victims and killers -the cops- from her home state of New York. Both candidates appear to spend time in South Carolina besotted by Martin Luther King, a black man shot many years ago, all the while saying little to nothing about another black man shot and killed by men in uniform a little over a year ago. I’m waiting to see who will step up and bring “change” to the reality behind that painfully long list in the pic.